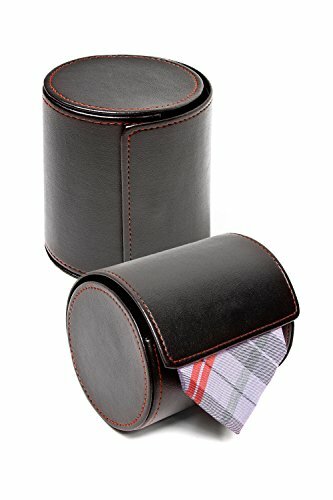 Crafted in black with red stitching and an easy to use silver clasp this excellent leatherette gift roll makes for the perfect container to store and ship your neckwear in style. Great for gifts use. Holds up to 1 standard necktie or 2 skinny ties. Imported. Easily fits 1 standard necktie or 2 skinny ties or 1-2 bowties. Perfect business gift or formal present. Comes in stylish gift-quality packaging. Material: Durable faux vegan leather reinforced with PU cylinder frame. Dimensions: 3.85W x 3.75L x 4.75H inches. If you have any questions about this product by Ties.com, contact us by completing and submitting the form below. If you are looking for a specif part number, please include it with your message.